In 1952, on 16 January, General de Gaulle wrote a letter expressing his last wishes concerning the organisation of his funeral. He wanted it to be very simple and without any national honours. On his sudden death on 9 November 1970, his wife followed his instructions and requested that his body be carried on a military vehicle. 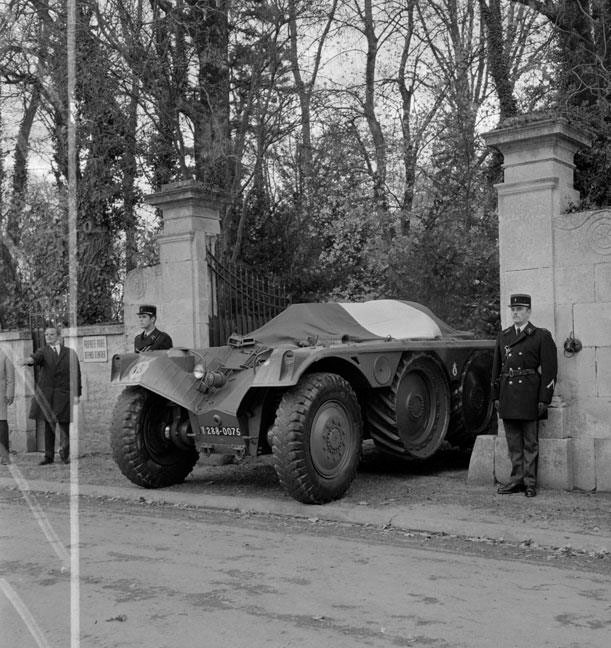 His remains, simply covered with a French flag, were placed on a turretless Panhard armored vehicle, which took him from his property, La Boisserie, to the Colombey-les-Deux-Eglises church. "I want my funeral to be held at Colombey-les-Deux-Eglises. […]The ceremony is to be organised by my son, my daughter, my son-in-law, and my daughter-in-law, with the assistance of my cabinet, in a manner that is to be extremely simple. I do not want a state funeral. Neither the president, nor the ministers, neither representatives of the National Assembly, nor constitutional bodies. The French Armed Forces alone may participate in their official capacity; however, their participation must be very modest, without music or brass bands or bugle calls." Film "Obsèques du général de Gaulle : cérémonie à Colombey-les-Deux-Eglises", 12 Nov. 1970 video; 1:38:00: Panhard from 15:44 to 16:48.